At one time, or another, all of us have dealt with storage space shortage. Lacking free space can really be a hustle and as mobile tech becomes smaller and runs more advanced software and rich multimedia, storage limitations become very common. SSD drives bring enormous performance gain, but their limited capacity is definitely complicating the situation. Modern operating systems are severely affected by storage limitations as developers are tasked with cramming increasingly sophisticated code into tiny spaces. The latest installment of Microsoft Windows is particularly vulnerable in this respect, especially, considering the company’s ambitious desire to make it run across an enormous array of devices, ranging all the way from beastly gaming PC rigs, down to budget, pocketsize smartphones. Yet, with Windows 10, Microsoft has devised a set of clever solutions to the problem, leaving the OS with the most optimized and tiny footprint of any Windows yet. This, of course, is absolutely necessary if Microsoft’s “One Windows” ideology is ever going to see the light of day. The people over at Windows Storage and Deployment Teams are the people we have to thank for the smaller and more efficient Windows 10 and they have managed to boil their complicated solution to two basic technologies. First up, Windows 10 is big on compression. The development team has worked out the most efficient way of compressing Windows system files yet and the storage gains they have achieved, by doing so are pretty impressive. A 32-bit Windows 10 installation is reduced by 1.5GB, while a typical 64-bit version is slashed by 2.6GB. This may not sound like much, but picture this in a tablet or phone. That’s a lot of extra multimedia space right there. This all sounds really good, but as we know, compression is not for every device, mainly because it is a CPU costly task. 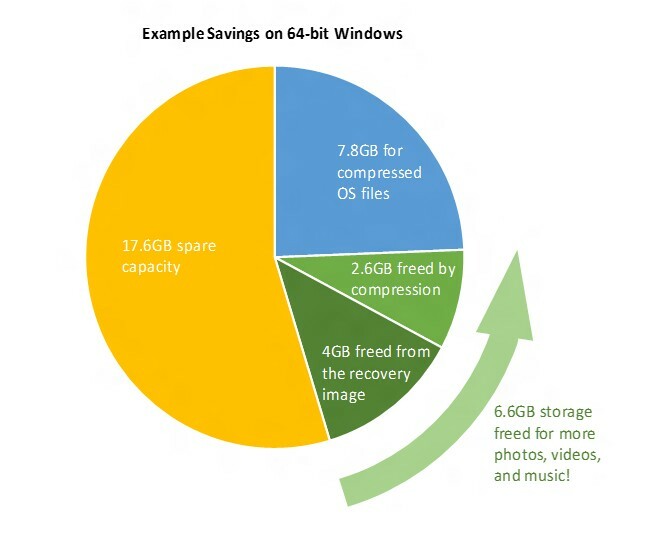 Microsoft has addressed these issues and is making compression an intelligent, opt-in option. Compression mechanisms will be enabled only after a clever process of assessment of the device’s RAM, CPU and general computing capabilities concludes that the extra processing tasks will not affect user perceivable responsiveness and performance. The new compression mechanism can be applied with a fresh Windows 10 install and is now a party of the standard installation process, so it no longer requires special steps from the OEM, like the WIMBOOT compression, found in special versions of Windows 8.1. To make the new technology even more widely-available, Microsoft has made it available through OS update, as well as a fresh install. Speaking of updating, there is the other storage solution that Windows 10 brings to the table. The new OS is no longer tied down to bulky recovery images. Up until now, this was the only way Windows could recover itself after an accidental system file corruption. Windows 10 handles these tasks, known as Refresh and Reset in a much more clever way and can essentially rebuild itself using only runtime system files. This not only eliminates the need to store a dedicated recovery image, although you still can if you desire, but also leaves the installation intact after a recover. So no more endless update installs should be required after the process is complete.